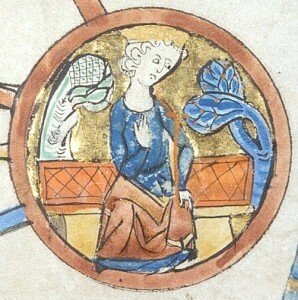 Following the death of William Rufus in 1100, his younger brother Henry took the English crown, spurning the claim of his elder brother, Robert Curthose, duke of Normandy. This led to tensions between the two brothers and several times England and Normandy almost went to war. But no major outbreak of violence took place until 1105, when Henry I invaded Normandy. In the following year Henry was able to defeat and capture his brother at the Battle of Tinchebrai (or Tinchebray), which took place on September 28, 1106. One of the medieval accounts about this war comes from The Roman de Rou, by Wace. The author was a prebend and scholar from Normandy, who was commissioned by Henry II in the 1160s to write a chronicle in verse of the dukes of Normandy. The account is not finished, cutting off just after the battle of Tinchebrai, perhaps because Wace had fallen out of favour of the English king. The portion translated below from this chronicle seems is one of the most detailed accounts of the fighting that took place, and may have been based on some local sources. The bracketed numbers indicated the lines of the verse chronicle. The king had in his prison a knight by the name of Thierry. His family was from Caen and he was born in Caen, the son of Ralph FitzOgier. His relatives had loved him very dearly. He was a knight of great courage with many wounds on his face; he was bold, as was evident from the great injuries he had received. This Thierry and many more men, the finest in Caen, had been captured by Robert the Old of Saint-Rémy at Cagny in the Hiémois. They were travelling from Argences to Caen with the intention of going to Caen, but this Robert, who was cunning, was lying in wait for them and brought them to a halt. He had assembled his friends and knights from his region and was pretending to go hunting in order to lie in wait for the men from Caen. When he saw the opportunity, he lay in wait for them and captured them all; none of them escaped. It was easy to capture them; they could not defend themselves as they had insufficient knights and were not riding their warhorses. Thierry fought stoutly and defended himself for a long time, but because of the wounds to his face he was knocked down and captured. When Robert of Saint-Rémy had taken his booty as he pleased, he prepared his prisoners and bound them over by oath not to escape. He took them all to Torigny, not wanting to go to Saint-Rémy. He sold and handed over his prisoners to Robert FitzHaimo, who at that time was of great renown; he bought them very willingly. By way of agreement, in this first instance, he gave him the whole of Charbonière and granted him other lands and fiefs in a number of places. Robert FitzHaimo thought that, if he could, he would promote his own cause thanks to the prisoners. He sent a messenger at once to Domfront, informing the king, who was there, that he should come to him without delay, for he thought he could advance his cause greatly. (11163-214). Taken, with the permission of the translator, Glyn S. Burgess, and of Roger Long, Chairman of the Publications Committee, Société Jersiaise, from Wace, The Roman de Rou, Translated by Glyn S. Burgess with the Text of Anthony J. Holden and Notes by Glyn S. Burgess and Elisabeth van Houts, Société Jersiaise, 2002, ISBN 0 901897 33 7 (Special Edition), 0 901897 34 5 (Standard Edition). This entry was posted in Primary Sources and tagged 12C, England, Normandy. Bookmark the permalink.